The March issue of SNR is available. Starting this month readers will get a double dose!!! 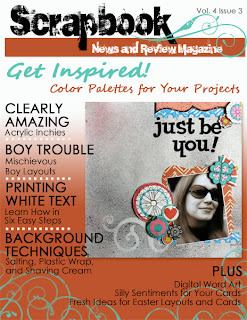 The issue available right now is filled with all the eye candy inspiration one could hope for in a craft magazine. You'll find over 400 images covering scrapbooking, card making, stamping and mixed media projects. Then on the last Sunday of of every month, a second issue will be released packed full of tutorials, the Product Parade and several primers including ink, paint, Perfect pearls/Pearl Ex. This issue will also feature some fantastic articles covering all sorts of topics. This issue will be available on March 27th this month. Don't miss it!!! !